Zhejiang (Chinese: 浙江; pinyin: Zhèjiāng) is a province of the People's Republic of China located along the country's southeastern coast. 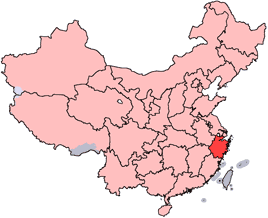 It borders Jiangsu province and Shanghai municipality to the north, Anhui province to the northwest, Jiangxi province to the west, and Fujian province to the south. To its east is the East China Sea and even further east lies the Ryukyu Islands of Japan. The word Zhejiang (meaning "crooked river") was the old name of the Qiantang River that passes through Hangzhou, the provincial capital. The name of the province is often abbreviated to "Zhe" (浙). Zhejiang has been enjoying a dramatic upsurge in its economy and standard of living during the twentieth and twenty-first centuries. Situated with its eastern border on the East China Sea, the province enjoys the booming trade through its ports and the financial services needed to support that trade. Historically on the periphery of Chinese power and economy, that began to change with the construction of the Grand Canal of China through the province. Zhejiang has won renown for its naturally beauty and for the role the province has played in fostering Buddhism, especially Zen Buddhism. Zhejiang was outside the sphere of influence of early Chinese civilization during the Shang Dynasty, which lasted from the sixteenth to the eleventh century B.C.E. Instead, it was largely populated by peoples collectively known as the Yue, such as the Dongyue and the Ouyue. Starting from the Spring and Autumn Period, a state of Yue emerged in northern Zhejiang that was heavily influenced by the Chinese civilization further north. Under King Goujian of Yue it reached its zenith and was able to wipe out the state of Wu, a major power at the time in 473 B.C.E. In 333 B.C.E., this state was conquered by the state of Chu that controlled the area to the west of Zhejiang, and ultimately the state of Qin was able to subjugate all the states of China under its control in 221 B.C.E., thereby establishing the first unified Chinese empire. Throughout the Qin Dynasty (221 to 206 B.C.E.) and Han Dynasty (206 B.C.E. to 220 C.E. ), Zhejiang was under the control of the unified Chinese state, though it was mostly considered a frontier area. Southern Zhejiang was under minimal control of that state, since it was still inhabited by Yue peoples with their own political and social structures. Near the end of the Han Dynasty, Zhejiang became home to minor warlords such as Yan Baihu and Wang Lang, who fell in turn to Sun Ce and Sun Quan, the two leaders who eventually established the Kingdom of Wu (222-280), one of the Three Kingdoms. From the fourth century onwards, China was subject to repeated invasions from the north by nomadic peoples, who conquered areas of North China and established the Sixteen Kingdoms and the Northern Dynasties. The result was a massive influx of refugees that arrived from the north and poured into South China, which hosted the refugee Eastern Jin Dynasty and Southern Dynasties. This large transfer of population accelerated the sinicization of South China, including Zhejiang. The link between Zhejiang and the center of Chinese civilization was further enhanced when the Sui Dynasty reestablished unity and built the Grand Canal of China, which linked Hangzhou to the North China Plain. Later on, the Tang Dynasty (618-907) presided over a golden age of China, and Zhejiang was a part of their Jiangnandong Circuit, an area which began to appear experience increasing prosperity. As the Tang Dynasty disintegrated, Zhejiang constituted most of the territory of the regional kingdom of Wuyue, which grew in its place. A tripod planter from the Ming Dynasty. It is housed in the Smithsonian in Washington, D.C. The Northern Song Dynasty re-established unity of all of China around 960. Under the Song Dynasty, the prosperity of South China began to overtake North China. After the north was lost to the Jurchens in 1127, Zhejiang began to experience tremendous economic growth. 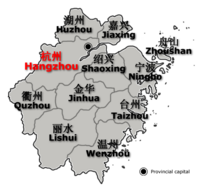 Its modern provincial capital, Hangzhou, was the capital of the Han Chinese Southern Song Dynasty which held on to most of the area of South China. Renowned for its prosperity and beauty, it may have been the largest city in the world at the time. Ever since then, north Zhejiang together with neighboring south Jiangsu has been synonymous with luxury and opulence in Chinese culture. Mongol conquest and the establishment of the Yuan Dynasty in 1279 ended Hangzhou's reign as the most important city in China politically, but it still continued to prosper. At one point, Marco Polo visited the city, (which he called "Kinsay,"), and referred to it as the "finest and noblest city" in the world." The Ming Dynasty which eventually drove out the Mongols in 1368 were the first to establish Zhejiang as a full-fledged province, and its borders have not experienced drastic change since that time. After the People's Republic of China took control of the Chinese mainland in 1949, the government of the Republic of China based in Taiwan continued to control the Dachen Islands off the coast of Zhejiang until 1955. They established a rival Zhejiang provincial government there, which has created a situation similar to Fujian province, where each of the governments (both the PRC and Taiwan) have established their own distinct province with the same name. Sun rising over West Lake. Zhejiang consists mostly of hills, which account for about 70 percent of its total area. Altitudes tend to be highest to the south and west, and the highest peak of the province, Huangyajian Peak at an altitude of 1921 m, can be found in the southwest. Mountain ranges include the Yandang Mountains, Tianmu Mountains, Tiantai Mountains, and Mogan Mountains, which traverse the province at altitudes ranging from 200 to 1000 m.
Along with mountains and hills, valleys and plains are found along the coastline and rivers of Zhejiang. The northern part of the province is just south of the Yangtze Delta, and consists of plains around the cities of Hangzhou, Jiaxing, and Huzhou, where the Grand Canal of China enters from the northern border and ends at Hangzhou. Another relatively flat area can be found along the Qujiang River, around the cities of Quzhou and Jinhua. Major rivers include the Qiantang River and the Oujiang River. Most of the rivers in the province carve out valleys in the highlands, with plenty of rapids and other features associated with such topography. Famous lakes in the province include the West Lake of Hangzhou and the South Lake of Jiaxing. In addition to its territory on the mainland, Zhejiang contains over three thousand islands along its ragged coastline. The largest, Zhoushan Island, is the third largest island in China, after Hainan and Chongming. There are also many bays, with Hangzhou Bay being the largest. Zhejiang has a humid subtropical climate with four distinct seasons. Spring starts in March and is rainy with varying types of weather. Summer, which lasts from June to September, is long, hot and humid. Fall is generally dry, warm and sunny. Finally, winters are short but very cold, except in the far south. The average annual temperature in the province is around 15 to 19°C, with the average January temperature ranging around 2 to 8°C, and the average July temperature ranging from 27 to 30°C. Annual precipitation is about 1000 to 1900 mm. There is plenty of rainfall in early summer, and by late summer Zhejiang is directly threatened by the many typhoons that form in the Pacific Ocean. The eleven prefecture-level divisions of Zhejiang are subdivided into 90 county-level divisions (32 districts, 22 county-level cities, 35 counties, and one autonomous county). Those are in turn divided into 1570 township-level divisions (761 towns, 505 townships, 14 ethnic townships, and 290 subdistricts). The province is traditionally known as the "Land of Fish and Rice," and true to its name, rice is the main crop, followed closely by wheat. Also true to its namesake, north Zhejiang is a major center of aquaculture in China, with the Zhoushan fishery serving as the largest fishery in the entire country. 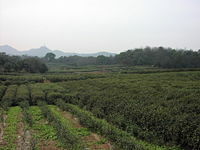 Some of the province's main cash crops include jute and cotton, and the province also leads all of China in tea production, with its renowned Longjing tea, grown mainly in Hangzhou. Zhejiang is also a producer of silk, for which it is ranked second among all of the provinces. Zhejiang possesses rich reserves of over 100 different minerals, including 12 non-metallic ones that rank among the top three in China in terms of their reserve quantities. Its reserves of stone coal, pyrophyllite, limestone for cement-making and limestone for construction rank first in the whole country. Its fluorite reserve ranks as the second highest in the country, while the reserves of silica, pearlite, granite, zeolite, silver, zinc, vanadium and cadmium all rank within the country’s top tens. Zhejiang's manufacturing is centered upon its electromechanical, textiles, chemical, food, and construction materials industries. 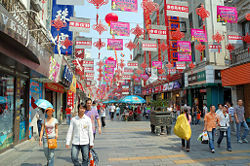 In recent years, Zhejiang has followed its own unique development model, dubbed the "Zhejiang model," which is based on prioritizing and encouraging entrepreneurship, emphasizing small businesses responsive to the whims of the market, large public investments into infrastructure, and the production of low cost goods in bulk for both domestic consumption and export. As a result of these reforms, Zhejiang has made itself one of the richest provinces in the country, and the famous "Zhejiang spirit" has become something of a legend within China. While all of this is positive, some economists are now worrying that the model is not sustainable, in that it is inefficient and places unreasonable demands on raw materials and public utilities. Some also fear that it is a dead end, since the myriad of small businesses in Zhejiang producing cheap goods in bulk are unable to move to more sophisticated or technologically-oriented industries. In addition to agriculture and industry, Zhejiang's coastal location makes it a strong economic center in terms of sea trade, with Ningbo, Wenzhou, Taizhou and Zhoushan serving as the major commercial ports in the province. The Hangzhou Bay Bridge is being constructed between Haiyan County and Cixi, and once completed, it will be the longest sea-crossing bridge in the entire world. The per capita disposable income of urbanites in Zhejiang reached 18,265 yuan (US$2,291) in 2006, an annual real growth of 10.4 percent. The per capita pure income of rural residents stood at 7,335 yuan, a real growth of 6.4 percent year-on-year. Its nominal GDP for 2006 was 1.565 trillion yuan (US$196 billion) with a per capita of US$3,975. In 2005, Zhejiang's primary, secondary, and tertiary industries were worth 87.3 billion yuan (US$10.8 billion), 714.7 billion yuan (US$88.1 billion), and 534.5 billion yuan (US$65.9 billion) respectively. While north Zhejiang has historically been an economic power, the southern part of Zhejiang is mountainous and ill-suited for farming, and has traditionally been poor and underdeveloped. The 1978 economic reforms of Deng Xiaoping, however, have brought change to that region which is unparalleled across the rest of China. Driven by hard work, an entrepreneuring spirit, low labor costs, and an eye for the world market, south Zhejiang (especially cities such as Wenzhou and Yiwu) has become a major center for exports. This development, together with the traditional prosperity of north Zhejiang, has allowed the whole province of Zhejiang to leapfrog over several other provinces and become one of the richest in all of China. Han Chinese make up the vast majority of the population, but there is small representation from other groups. In total, fifty-three different ethnic groups live in the province, with members of the minority groups accounting for only about 0.7 percent of the population. The main minority ethnic groups are the Zhuang, Yao, She, Hui and Manchus, with the She and Hui nationalities serving as the two largest. According to statistics taken at the end of 2000, Zhejiang had 35 institutes of higher education with 222,270 students and 18,981 teachers. It also had 2,940 regular secondary schools with 2.50 million students and 139,300 teachers and 11,800 primary schools with 3.54 million students and 160,400 teachers. The illiteracy rate dropped from 17.46 percent in 1990 to 7.06 percent in 2000, a decrease of 10.40 percent. Zhejiang's mountainous terrain has divided its people and thereby prevented a single common culture from forming throughout the province. However, it has fostered the development of many individual localized cultures. Linguistically speaking, Zhejiang is extremely diverse. The inhabitants of Zhejiang speak Wu, a subdivision of spoken Chinese, but the Wu dialects are very diverse, especially in the south, where one valley may speak a dialect completely unintelligible to another valley a few kilometers away. Non-Wu dialects are spoken as well, mostly along the borders. Mandarin and Hui dialects are spoken on the border with Anhui, while Min dialects are spoken on the border with Fujian. In addition to these variations, Standard Chinese is also spoken by most people in the province. Zhejiang is the home of Yueju (越劇), one of the most prominent forms of Chinese opera. Yueju originated in Shengzhou and is traditionally performed by actresses only, in both male and female roles. Other important opera traditions include Yongju (of Ningbo), Shaoju (of Shaoxing), Ouju (of Wenzhou), Wuju (of Jinhua), Taizhou Luantan (of Taizhou) and Zhuji Luantan (of Zhuji). Longjing tea (also called dragon well tea), originating in Hangzhou, is one of the most prestigious, if not the most prestigious Chinese tea. Hangzhou is also renowned for its silk umbrellas and folding fans. Zhejiang cuisine (itself subdivided into many traditions, including Hangzhou cuisine) is one of the eight great traditions of Chinese cuisine. Since ancient times, north Zhejiang has been famed for its prosperity and opulence, and simply inserting north Zhejiang place names into poetry gave an effect of dreaminess, a literary trick which was used by many famous poets throughout Chinese history. In particular, the fame of Hangzhou (as well as Suzhou in neighboring Jiangsu province) has led to the popular saying: 上有天堂，下有蘇杭 (above there is heaven, below there is Suzhou and Hangzhou), a saying that continues to be a source of pride for the people of these two currently prosperous cities. Baoguo Temple, the oldest intact wooden structure in southern China, located 15km north of Ningbo. Putuo Shan, one of the most famous Buddhist mountains in China. Shaoxing, Wuzhen and other waterway towns. Hangzhou the province's ancient capital city. Tiantai Shan, a mountain important to Zen Buddhists. Yandang Shan, a mountainous scenic area north of Wenzhou. Qiandao Lake, lit. Thousand-island lake. 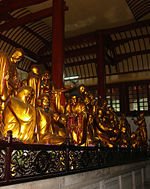 Guoqing Temple the founding place of Tiantai Buddhism, which was started during the Sui Dynasty. The Zhejiang Radio & Television, Hangzhou Radio & Television Group, Ningbo Radio & Television Group are the local broadcasters in Zhejiang Province. Programs are produced by Guinness of China Television and entertainment is produced by Wenzhou Television. Forster, Keith. Rebellion and Factionalism in a Chinese Province Zhejiang, 1966-1976. (Studies on contemporary China.) Armonk, NY: M.E. Sharpe, 1990. This page was last modified on 3 July 2013, at 15:50.